A petition calling for lane splitting to be legalized in all 50 states is drawing thousands of signatures on the White House's "We the People" section. Lane splitting, also known as "lane sharing" and "filtering," is the act of riding between lanes of cars. 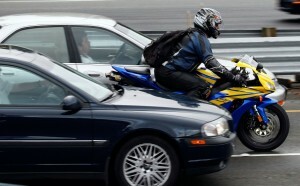 When done effectively and intelligently, the riding technique has been shown to help decrease traffic congestion, as well as a rider's risk of being the victim of a rear-end collision. The practice is common in most countries around the world and is seen as one of the major benefits of motorcycling in the traffic-choked cities of Europe and Asia. In the United States, however, the practice is technically only legal in the state of California. BikerNewsOnline reported recently on the American Motorcyclist Association's growing support for the practice. The petition was first created in early December and quickly earned enough signatures to become publicly searchable. The next threshold it must reach is 100,000 signatures, at which point it will receive an official response from the president of the United States. Some critics have pointed out that the federal government may not have the direct power to enact cross-country legalization of lane splitting and that the issue would instead need to be dealt with on a state-by-state basis. However, supporters of the petition argue that it will help to use the president's power of "bully pulpit" to highlight the issue's relevance and importance. You can read the petition and sign your name to it by clicking here. Once they have signed the petition, signatories are required to verify their support via email. When the petition achieves 100,000 signatures, the president's response will be made public and as well as emailed to all those who took part.